For Chitra Pournami (Full Moon Day that comes in the tamil month of Chithirai), Mom makes some special dish at home. Every time, she makes either semiya payasam or sago payasam. Sometimes she mixs both. This time, I asked her to prepare paruppu payasam for a change and she accepted to prepare it. When she entered the kitchen, my mom's colleague came home to seek some personal help. I asked her to sit with her colleague and continued to prepare the payasam on my way. Yes. Mom's way of preparing this payasam is different. She doesn't add milk, doesn't disolve Jaggery in water and adds grated coconut. I used this opportunity to take pictures for both step wise and final. I prepared this payasam only for 3 members. Since my mom's colleague had also come, we shared it in 4 bowls and enjoyed it after offering to God. Wait, I can read your mind voice. You are wondering how I clicked these pictures when guest had come home. Am I right? I saved my share and clicked this picture when she left home. 1) Take a pan. Heat ghee. Roast cashew nuts and raisins. When cashew nuts turns brown and raisins become pulpy, transfer to a plate. 2) In the same pan, roast moong dal until it release nice aroma and changes in its colour. 3) Transfer the roasted moong dal to a pressure cooker. Add 2 cups of water and pressure cook it for 4-5 whistles. 4) Meanwhile, in another pan, heat jaggery, crushed cardamom along with 1/2 cup of water just until it dissolves. 5) When the steam releases from the pressure cooker, remove the lid and mash it well using a ladle. 6) Filter the dissolved jaggery water to remove impurities. Add this to the mashed moong dal. Mix well. 7) Allow this kheer to boil. When it is boiling turn the flame off and pour the milk. 8) Add roasted cashew nuts and raisins. Mix well. 9) Moong Dal Kheer is ready to serve. 1) Increaase of decrease the jaggery quantity as per your taste. 2) Addition of milk is optional. To make a vegan version of it, skip the milk and roast the cashews in oil. Add the same quantity of water instead of milk. 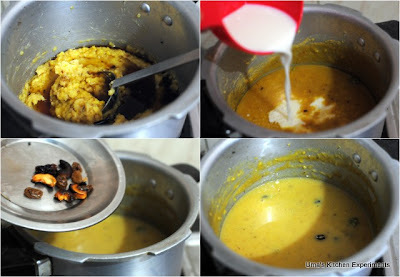 3) Payasam consistency depends upon the water quantity you add. So, increase or decrease the water based on your preference. 4) Don't forget to add the milk only after you turned the flame off. Otherwise, It might get curdled. nice clicks.. innum evlo moong dhal recipes vechurukkenga..? my fav one,amma add coconut milk instead of milk or fried coconut pieces...it looks yummm!! Looks divine... beautiful clicks as always... I too have this in drafts.. gotta schedule.. The colour of the payasam itself is very pleasing, very tempting payasam..
For the Vegans, Instead of regular milk, try adding coconut milk. Hi Anonymous, You can also skip milk and ghee for this recipe for vegan option. Use oil for roasting nuts.